In the last few years, limo bus rentals have become one of the big new things in the entertainment and nightlife club industries. You see limo busses all over big cities like Los Angeles, Hollywood and Beverly Hills. Now you can party like a rock star in The OC, IE, San Bernadino, Pasadena, Glendora and the San Gabriel Valley. Treat yourself and your freinds with a coach or mini-size to big-size bus that has been converted into a luxury limousine. It has limousine style leather seats and facilities like a bar, a refrigerator, air conditioning, high end audio systems, LCD flat screen televisions, strobe and disco lights, even a stripper pole! 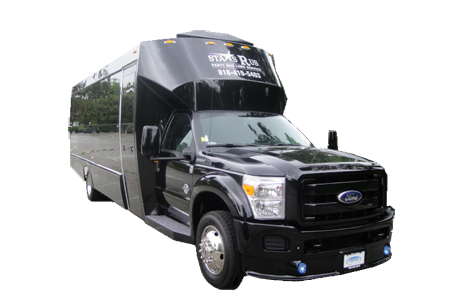 A Stars R Us Party Bus Limo is the ultimate in style, elegance and fun! Your Sweet 15 or 16 just got sweeter! We have the sweetest party bus limousines in Los Angeles, San Gabriel Valley and San Bernadino. Su dulce 15 o 16 anos acaba de conseguir mas dulce! Tenemos el autobs mas dulce del partido para su evento! Proudly serving our Gay and Lesbian community. All our limo buses are well maintained, clean and operated by experienced and professional drivers. All our drivers and vehicles are fully licensed and insured. We employ multi-lingual drivers to accomodate you in the world class city that is Los Angeles. Along with a memorable event and a good time, our clients' safety and comfort is our primary concern.